Last month, we introduced our article series on developing your business strategy. We outlined an overall strategy development plan for your business. From your elevator pitch to your executive summary, you should have a good indication of what you what to accomplish. 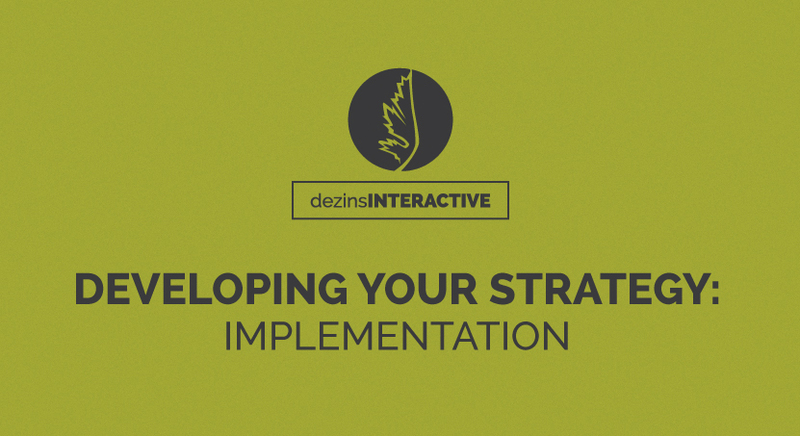 In the second installment of “Developing Your Strategy,” we will focus on the concept of strategy implementation. Simply stated, strategy implementation can be defined as the process of putting plans and strategies into action to ultimately attain strategic goals and objectives. By now, you have developed a strategic plan. These plans often sit and are not put into use. Implementation turns strategies into reality. Without it, strategy is nothing. 95% of a typical workforce doesn’t understand their organization’s strategy. 60% of organizations don’t correlate strategy to budgeting. 86% of business owners and managers spend less than one hour per month discussing strategy. Bottom line, strategic implementation is crucial to a company’s accomplishments. It is an administrative task and on-going process. In order to see your strategic plan through, implementation will involve assigning tasks to individuals and developing timelines. Any successful implementation will have a clear leader, whether it is the owner of a business or the CEO of a company. Strategy implementation is simply impossible without a strong organizational structure. This person will communicate the vision and goals necessary for success. All organization personnel should be fully engaged in the plan. The leader will delegate tasks and roles to individual employees. Performance measurement tools provide motivation and allow progress discussion to occur. Implementation should also include a strategic map. This map identifies the main factors that will guide performance. Two major mistakes in strategic implementation are a lack of communication and a plan that contains too many goals. Plans are often overwhelming and have ideas that are not concrete. Therefore, the progress of implementation is hard to track. Instead of tracking development annually, do so bi-weekly or even monthly. This will prevent employees from neglecting your goals and getting caught up in day-to-day tasks. You should also make your employees accountable for implementing their parts of the strategic plan. If not enforced, your plan will never be fully or correctly executed. Ask yourself, what is it that you need to accomplish your plan? Most often, there are several things that need to be in place. You have to have the right set of employees on board to help you. Resources are vital. You will also need sufficient funds to support your implementation. In addition to enough money, you have to consider the time it will take your team to achieve your goals. Communication must be open and collaborative. The manager must schedule meetings to address plan updates and progress. Technologies should also be set-up to track the implementation. We hope these ideas will guide you to implement your business strategies. Stay tuned for next month’s strategy series finale article.